Yes it is another of those oh so friendly updates! I came to emails today for the first time in 3 or 4 days and I had a hideous amount of junk mail which has taken me a while to discard. The title is what it is because we are about 1/3 of the way across America. 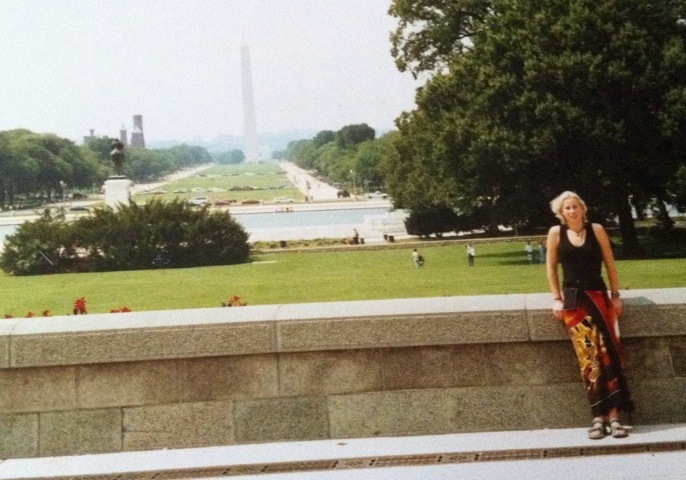 For those of you following on a map we went from New York to Washington, Washington to Nashville. 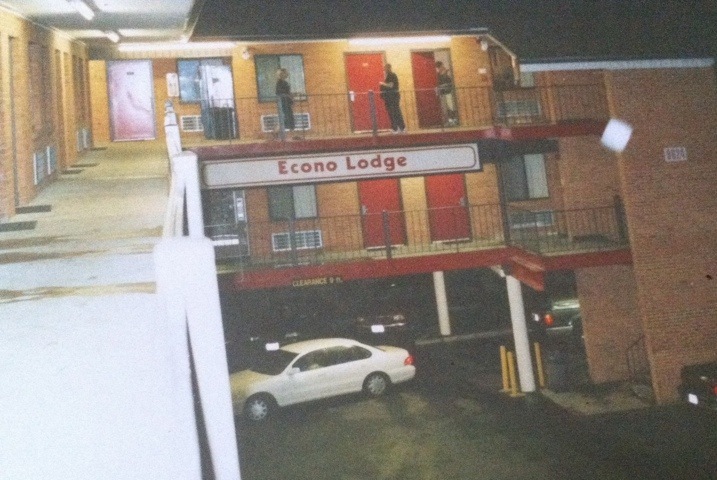 We have found good line of cheap and clean motels just outside of the big cities and we have been staying in them the whole time, amusingly they are called Econo Lodge. The first one that we were in just, outside of Washington, Chloe and I couldn’t get into our room as the key just wouldn’t let us in. We had fits of hysterics as we thought that it was just us being stupid. We nearly snapped the key (credit card type thing) in the lock. Managed to get them to somehow change it and we could finally get in and out with ease! We visited the Capitol and did a tour around it which was fascinating. It has housed congress since 1800. George Washington chose the site for it during his presidency, hew laid the corner-stone on September 18th 1793. The original building was completed in 1826 and the contemporary changes include an extension of the east front in 1962 and restoration of the west front and the statue of freedom. Inside we saw the room where the House of Representatives met from 1807-57. In 1864 each State was invited to contribute two statues in marble or bronze of deceased citizens known for historical reasons or for civil or military services. By 1933 there were so many statues that some had to be moved to another part of the Capitol. 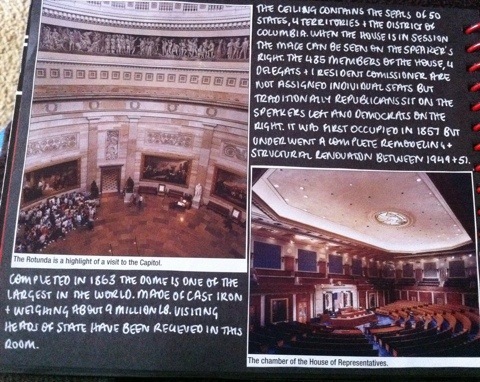 The ceiling contains the seals of 50 states, 4 territories and the District of Columbia. When the house is in session the Mace can be seen on the speaker’s right. The 435 members of the house, 4 delegates and 1 resident commissioner are not assigned individual seats but traditionally the republicans sit on the speakers left and the democrats on the speaker’s right. It was first occupied in 1857 but underwent a complete remodelling between 1949 and 1951. We also visited the Senate chamber where the President and the elected officials from across the country make all of the major decisions for the country. The President of the Senates is the Vice President of the USA. In the niches of the gallery are busts of 20 Vice Presidents. The room was completed in 1859 and renovated along with the house 90 years later. 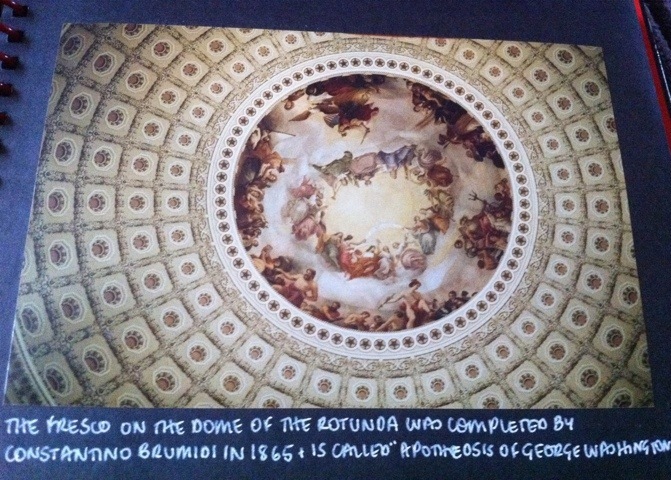 The rotunda of the capitol has a fresco in the dome that was completed by Constantino Brumindi in 1865 and it is called “The Apotheosis of George Washington”. The dome is one of the largest in the world and it is made of cast iron and is believed to weigh about 9 million pounds. All visiting heads of state are received in this room. 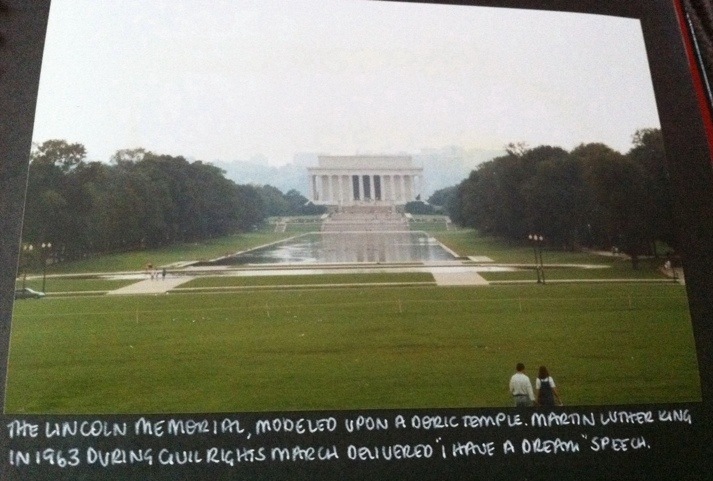 We also saw the Lincoln Memorial (West end of the Mall in West Potomac Park) which is modelled on the Parthenon; it was from here that Martin Luther King in 1963 said his famous “I have a dream” speech. Inside the monument there is a statue of Abraham Lincoln grasping the arms of his throne like chair in deep thought. There are inscriptions of two of his most celebrated speeches – the Gettysburg Address and the Second Inaugural Address carved on the north and south walls. We only saw this one from a distance but we walked right up to and past the Washington Monument. It is an unadorned marble obelisk built in memory of George Washington. It is 555ft high and is the tallest all-masonry structure in the world towering over the city at south of Constitution Avenue on Madison Drive. Work started on the monument in 1848 but with various internal arguments and the Civil War disrupted the construction so that it was not complete until 1884. When the US Government took over the project in 1876 marble from a slightly different source was used and the transition line where work resumed can be seen at about 152ft. There is an elevator to the observation deck but we did not go up – it was way too hot and we didn’t fancy paying! 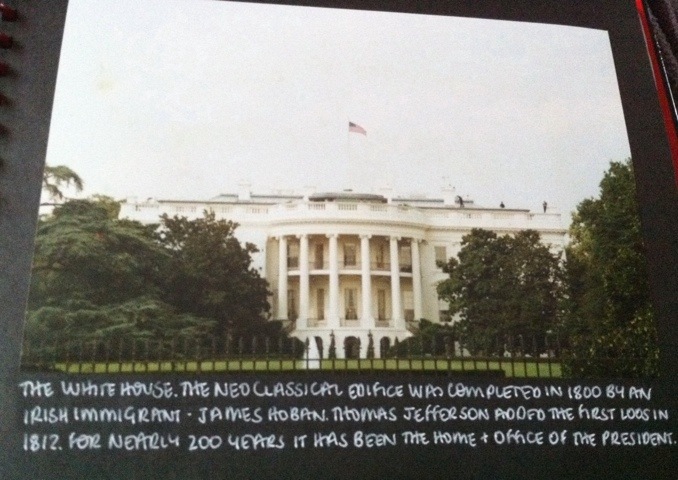 The White House has a neoclassical edifice which was completed in 1800 by an Irish immigrant called James Hoban who modelled it on the Georgian Manors of Dublin. Thomas Jefferson added the first loos just before the British burnt the place down in the war of 1812. It was quickly rebuilt and expanded, often in such a hurry that the whole building was on the verge of collapse. Harry Truman had to move out for four years from 1948 while the structure was stabilized – all the rooms had to be dismantled and a modern steel frame was inserted. Truman also added the balcony to the familiar south portico. For nearly 200 years it has been the home and the office of the president of the United States. Anyway enough about driving and facts on what we have seen, it will worry the parents too much! Thankfully the car had air conditioning which is a dream as it is so close to 100 and soooooooooooooo hot in the sun, eurgh, sweat city! I am maddeningly not going brown yet though. Frostie still remains white Farts, but is not melting away! Had a delicious supper last night of a Domino’s Pizza (I have never had one back in the UK and I didn’t actually think that they were that bad) I shared it with Si and Bob. We all sat in the boys’ room watching VH1 as all of the restaurants had closed at some ridiculously early hour. The time has gone back an hour now and so I am 6 hours behind UK time. We are in Nashville, Tennessee at the moment. Reading the guide-book it said that it was a dry state and we were all pretty darned worried about how we would survive. Thankfully it isn’t, the Rough Guide lies!! Well I have no more news for the moment. We are all off to go and try to record a CD now just down the road. We are going to be backing track singers I think, just how touristy is that! Then I think that we are heading off to Memphis tonight as it is only 100 miles. From there we are going down to an Indian Reservation and then down to New Orleans and then we are hoping that Audrey’s invitation is still open, if not we have spotted a very good Econo Lodge just outside of Austin. I guess that we might be with you about Wednesday of next week. I will have to call you though Audrey. It may not be today as I said in my message, garbled! Sorry I hate answer machines. Well I guess that you have all probably had enough of me now and so I going to go and try (ha ha) and prepare my vocal chords ready for later. This should be amusing!! Loads of love to one and all and I hope to hear from you all again soon. Ooh if anyone needs to get hold of me a.s.a.p. you can text or call Chloe’s mobile on 07710020036 it is a Vodaphone and cost you no extra. You will understand why I might be a little rushed though as Chloe pays for the call as well. Here are some personal bits. James – Glad to hear that you made it out of BA. More importantly, it is good to hear that your brother is doing much better. I am glad to hear that we made your birthday so special. At least you can’t forget us now! Roy – Great to hear from you. I hope that you are doing ok and that it is not too boring being back at Uni. I have got you on my list now so you will get the group emails of my trip around the States. It is very weird here without the others. Hugo – you pillock, I thought that you said that you were typing me an email as you were speaking to me – SO WHERE IS IT??? Em – Best of luck in finding a house, for GODS sake find one NEAR ME! PLEASE, I won’t be able to survive otherwise! (Tell Ez too) I am not sure if Tim would appreciate that thought though. I don’t know him well enough! The lads are random acquaintances of Chloe’s. Si is the elder brother of a friend of Chloe’s form Uni and she had never met him before and Bob and Kev are friends of his. Mike – Thanks for the text babe. Glad that you are missing me!! Ha ha ha just felt I had to make you totally jealous. Hope that the job hunting is going well. Ed – don’t worry about the price of the photos – APS are always expensive. Like you say I am sure that they are worth it. Neddy – Hello! Land of the living. Great that you are going to be in Jolly old Milton Lilbs for a bit when I get back so I will get to see you before you head up north. Glad that you are having a cool time in Taiwan. Pity about the night on the floor of the airport. Anca, Lili and Mara – I hope that the christening goes well on Sunday, I so wish that I could be there. I am going to try really hard to call you. I am not sure if I will be able to get the timing right though. I really need to buy my little niece a pressie and also I want to know what her godparents and so on have given her so that I don’t give her the same thing! Love you and miss you loads. ILE – so where is this email then? I want to know how V2001 was. You lucky so and so. Leah – tried calling your Mum but there was no reply, I will keep trying. I have a really horrible feeling that we are going to miss each other. How long are you in Spain for? May be we could meet from there? Hannah – How long were you away for, I am sure that you are meant to be back by now? I want to hear from you, I miss our regular phone calls. 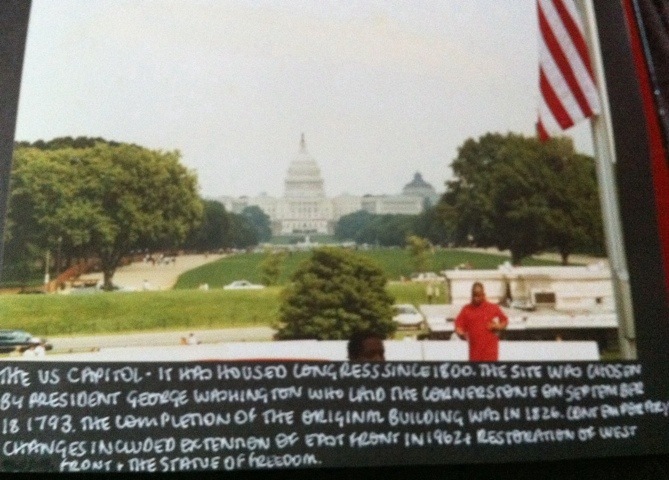 Posted on August 22, 2001, in The Big Trip 2001. Bookmark the permalink. Leave a comment.